Dodge College of Film and Media Arts is driven by an ambitious vision to provide an education that empowers students to tell compelling stories through visual media. Remaining on the cutting-edge of technological innovations that transform the creative possibilities of storytelling for the screen demands a significant investment and the involvement of our community of friends and benefactors. Your participation is vital. By naming a space within the Digital Media Arts Center or Chapman Studios West, your support will create extraordinary learning opportunities for our students, while providing Dodge College with room to grow and expand its outstanding programs. The space you name will be recognized in perpetuity, and your historic gift will ensure that Dodge College not only remains at the forefront of film education, but continues to be a trend-setter in the industry, continually breaking new ground and setting higher standards for its graduates. 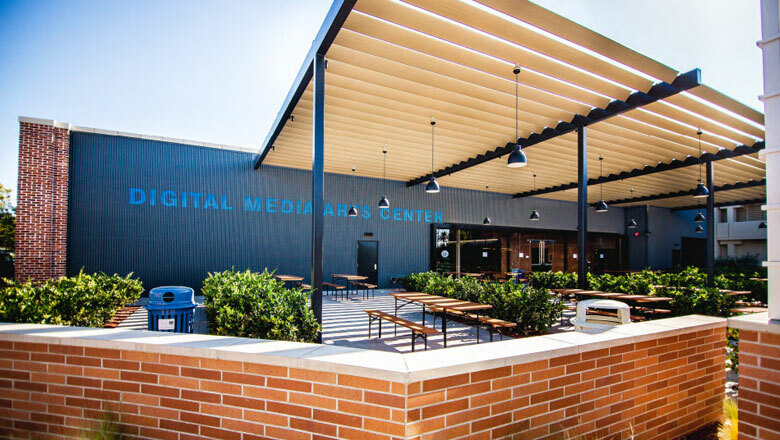 The 18,000 square-foot Digital Media Arts Center is specifically designed to establish Dodge College as a recognized leader in the digital arts, an area of current and projected growth in the booming creative economy. A working, industry-standard studio that rivals those of Pixar, Disney, Microsoft or Google, the Digital Media Arts Center combines “hang-out spaces” that include a coffee bar, relaxed indoor lounge and large patio with picnic tables, with flexible classrooms and laboratories that provide Dodge College students with access to the very latest technology so that they are well-prepared to work on Hollywood’s most technically sophisticated projects. Chapman Studios West offers facilities for expanding undergraduate and graduate degree programs in news and documentary filmmaking and television writing and production, creating much-needed general production and editing space. The building includes areas dedicated to the study of production design – including an extensive art and prop department and scene construction shop – as well as cinematography, documentary filmmaking, and television production. Chapman Studios West also provides a permanent home for the widely popular documentary filmmaking programs in the Dhont Documentary Center.